K104 wants to celebrate the life of the legendary Prince. 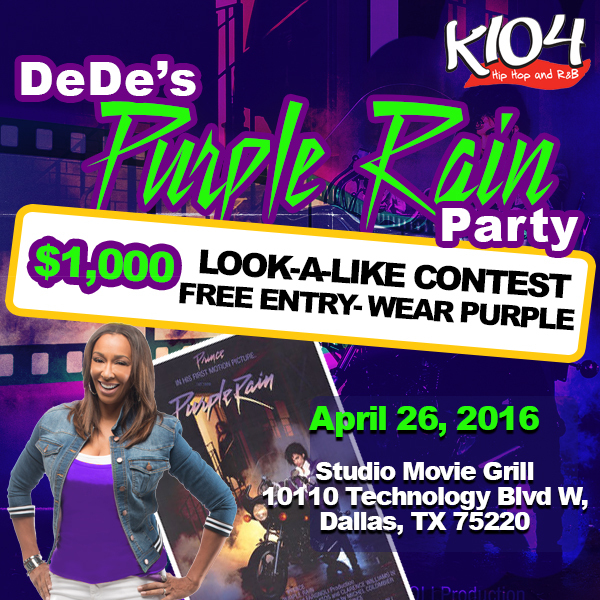 You’re invited to DeDe’s Purple Rain Party, Tuesday night at the Studio Movie Grill in Dallas off Northwest Highway. Wear your purple and come watch the movie Purple Rain. Plus, we’re having a Prince Look-A-Like contest for $1000! Wear your purple and come party with the K104 Family. Doors open at 6pm and the movie starts at 7pm. Once the theater is full, it’s full.